Every year the Eastern Monmouth Area Chamber of Commerce chooses a local organization and collects donations on their behalf at the annual Holiday Celebration & Networking Party. This year’s recipient is CVR (Center for Vocational Rehabilitation), a behavioral health/partial care program including psychiatric evaluation and assessment, individual and group counseling. CVR is in the business of reconstructing lives. Its purpose is to give individuals the opportunity to work in, live in, and to be contributing members of the community. Much of the success of CVR can be attributed to the active role that the organization has played in the local community, as well as the associations it has gained through this commitment to the community. CVR provides job placement services to people with disabilities, including continuous, long-term support that keeps the employees and employers motivated and satisfied. Job coaching services are designed to ensure the success of the employee and the satisfaction of the employer. In addition to all of the other services CVR offers, they also provide a nutritional program with healthy meals for people with special needs. The event flyer is posted below with all of the event information including a “Wish List” of healthy food items. Donations will be collected at the EMACC Holiday Party. Join us Wednesday, December 8, 2010 at 5:30pm at Bamm Hollow Country Club in Lincroft. The cost to attend is $30 in advance for chamber members and $50 for non-members. There will be an additional $20 charge for walk-ins. Last years holiday party was at Bamm Hollow also and it was fantastic. Great food and great people, don’t miss this chance to network, spread some holiday cheer and support CVR. Beach Party is one of the signature events that the Eastern Monmouth Area Chamber of Commerce puts on annually. I was within my first two weeks of living and working at the Jersey Shore last year so I didn’t make the event. I have had the last 12 months to look forward to it. I can’t speak from experience, but I am a member of the Business After Hours Committee and everyone on the committee is overflowing with excitement for this great event and it’s contagious. Join us from 4:30 to 8:30pm at the Sea Gulls’ Nest out on the beautiful Sandy Hook. It’s a beach party, dress casual but bring your business cards and sense of fun! There’s a great menu, cocktails, entertainment by Bruce Foster and rumor has it, a fabulous sunset. As a self-proclaimed weather nut, I have been stalking the Weather Channel on-line and the weather looks beach-a-rific with a forecast of 90 degrees (relatively cool by this summer’s standards) and mostly sunny. That has picture perfect sunset written all over it. Hope to see and/or meet you there. Click on the EMACC link above for easy on-line registration. Both members and non-members are welcome! 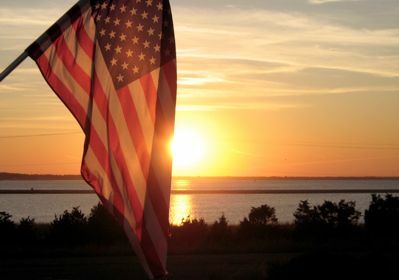 Ok, I can’t resist here’s a picture of the sunset from the Sea Gulls’ Nest website. I just got home and it’s now 10:30pm. I should be relaxing in front of the TV but I had such a great time tonight I wanted to at least blog it out. The Comfort Inn Middletown-Red Bank had our first ever exhibitor/sponsorship at The Best of Monmouth Summer Festival and it was an EVENT. I enjoyed myself from the moment I arrived. The staff at Branches went above and beyond to help me lug all of my stuff to my table. Spending four hours exhibiting next to Rachel and John Decker from Queen Vacuum was like hanging out with friends for the evening. Every where you turned there was great food and drink. So many fantastic restaurants with amazing spreads. Because of the event, I was able to connect with many of the people I get to talk to on-line frequently but have not had the opportunity to meet in person. Being an exhibitor/sponsor, I was given 20 tickets to give to 20 guests. Joanna Carides (@jmediamaven) was the first to take me up on the offer. I was able to catch up with her at the hotel last week and see her again at the actual event. She came to the Best of Monmouth with her friend Lorraine who is an illustrator and may have her book launch party with us in one of our meeting rooms. Allyson Pryor (@locallylove & @InnovationsIP) and I have been “tweeting” for months but hadn’t met in person before tonight when she came with her Mom and Laura Gesin (@lgesin & @asburypop). It was so nice to finally meet in real life and chat. I’m really glad I had the extra tickets to share. I also was able to meet Aaron Levine (@ALFinancial) and Chelsea and tomorrow night’s Tweet Up at the Lakewood Blue Claws (@BlueClaws) should be another fabulous event! Speaking of which, the second person I ran into was Lisa Kanda (@LKCoach) and she is a fun chick who will also be at the Tweet Up tomorrow night also. Spent some time talking to Craig Mahoney from Craig Mahoney Studios (@CraigMahoney) and I think I’m so not young anymore and saying “cool” and “awesome” don’t help but I am righteous enough to know what a podcast is. If you don’t, check it here. All in all, for everything we invested in this event it was, in a word, outstanding. Everyone was having a fantastic time, I was able to talk to the great people of Monmouth County and, hopefully, be a hotel of “Choice”. Tomorrow night, which may be almost tonight by the time this gets posted, (the event is Tuesday, June 29th) come out to the Lakewood Blue Claws game for Twitter night. Even if you aren’t on Twitter there will be fun times, an opportunity to meet your on-line friends and businesses, and network in a relaxed atmosphere. If you need/want tickets email me or tweet me @cimiddletwnnj. On Tuesday, June 29th head out to FirstEnergy Park home of the Lakewood BlueClaws for the Jersey Shore Summer Tweet Up! Tickets are only $10.00 and include a hot dogs, chips and a soda. The game starts at 7:05pm and we’ll be located in the Centerfield Cookout Area next to WRAT Trap. Come out and meet your Twitter and Facebook friends and fans. Buster will be there and a good time will be had by all. For more information or to order tickets call Dave Bochanski at 732.901.7000 ext 163 or email him. Find the Blue Claws on Twitter @BlueClaws or on Facebook. Just a quick reminder that the “Kick Cancer Overboard” Kick Off Party and Huge Networking Event is tomorrow, Tuesday, May 18th, 2010 at Branches in West Long Branch. The event starts at 5:30pm and they are expecting a full house so RSVP ASAP by e-mail or call 800.392.3588. 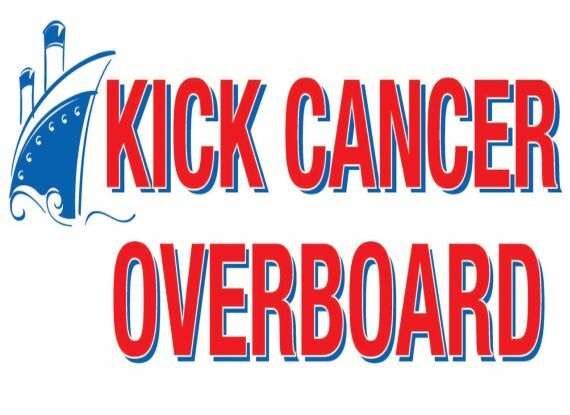 Excel Travel is offering the 1st Annual Kick Cancer Overboard Cruise to Bermuda. Join cancer survivors, their families, friends and supporters on a 5 night cruise to celebrate life. Prices for the cruise start as low as $525 and the Kick Off event is a small donation of $15 ( cash or check please). They have many surprises planned and it will be a great night of fun and networking. Keep in touch with the Kick Cancer Overboard Crew by visiting the website here, joining their Facebook Page and following on Twitter . If you have been considering becoming a member of the Jersey Shore CVB but haven’t made your commitment yet, now is the time. The Jersey Shore CVB will be offering a $100 membership now until the end of April and beginning on May 1st the cost will increase to $200. The membership numbers have tripled in the last 5 months and the CVB has many great events coming up. RADD, Recording Artists, Actors and Athletes Against Drunk Driving has become a marketing partner with the Jersey Shore CVB. RADD promotes road safety and making responsible choices about your lifestyle, a message that the CVB firmly believes in. They have campaigns for designated drivers and Hit the Road TXT L8R. The two will be working on bringing events and awareness to the Jersey Shore area. The Special Events committee is hard at work arranging Jersey Shore CVB networking events for each month. Look for more info on things to come including: May – a seminar on how to hire and utilize interns, June – backstage cocktails and networking at Count Basie Theatre; CVB Day on June 12 at Six Flags Great Adventure, July – dynamic social media presentation and networking boat ride aboard SeaStreak. The Jersey Shore Convention & Visitors Bureau will be releasing their new & vastly improved website in May. The Trade Show Committee will be very active at all of the upcoming Travel Shows. Last evenings general membership meeting was a huge success. Cliff Moore of I’m Impressed Inc. spoke on The Brand of Me and packaging and marketing and inspired the group. Following his presentation the attendees were broken down geographically to discuss packaging their businesses. Individuals were encourage to intermingle with other groups as well. A lot of great discussion and hopefully a lot of great ideas. The next Jersey Shore CVB general membership meeting will be on September 13, 2010. The Jersey Shore CVB is also on Facebook at www.facebook.com/visitthejerseyshore be sure to visit and “like” them. Consider becoming a member if you aren’t already, it’s a great investment for a small amount of money. If you would like to attend an event as a guest of the Comfort Inn Middletown, contact me and I’d be happy to bring you along. The next week or so is going to be very busy with events around the community and many of those I will be representing the Comfort Inn Middletown. It’s wonderful that spring is in the air and we’re shaking off the winter doldrums. I’d love to connect with you at any of the events mentioned so please come say hello. The Jersey Shore Convention and Visitors Bureau will be holding a general membership meeting this evening, April 21, 2010, from 5:00pm to 7:00pm at Doolan’s in Spring Lake. The focus of the meeting will be packaging Jersey Shore locations to appeal to tourists. I found out last night that Cliff Moore, “The Brand Of Me” will be presenting at the meeting as well. Two great reasons to not only attend but also to join the JSCVB if you are not already a member. Tomorrow night, April 22, 2010 will be a busy night of juggling events. The Monmouth Ocean Development Council will be hosting a “Meet & Greet the MODC Board of Directors” at the MODC offices in Wall from 5:30pm to 7:30pm. The fee for the event is $20.00 and you can make your reservations by emailing the MODC here. Following the MODC event, I’m heading over to Lakewood to catch an early season Lakewood BlueClaws game. As a baseball fan, I relish every opportunity to be able to catch a game live. Clean Ocean Action will be holding their 25th Annual Beach Sweeps on Saturday, April 24th from 9:00am to 12:30pm. There are 69 locations throughout the Jersey Shore area that you can participate. All you have to do is show up at the designated meeting spot for the location you choose. You can find more information on Clean Ocean Action’s Website here. I’m looking forward to it and the weather is supposed to be lovely. On Tuesday, April 27th, from 6:30pm to 8:00pm Two River Community Bank, 1250 Route 35 South, Middletown, invites area business people to a free networking, wine and cheese included. Call for details at (732) 706 9009. The Eastern Monmouth Chamber of Commerce is also celebrating a 25th anniversary. Wednesday, April 28 come out to Branches Catering in West Long Branch for Super Expo from 4:30pm to 7:00pm. Entrance is free with business card to connect with local area businesses. 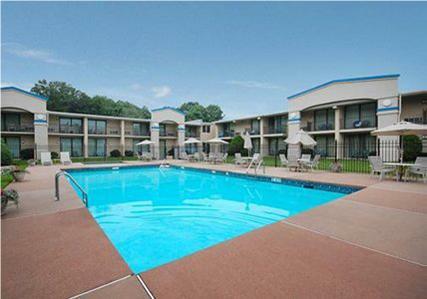 The Comfort Inn Middletown-Red Bank is a first time proud sponsor of this event. There will also be great prizes and giveaways. It’s a busy busy time and if we don’t catch up at one of these events, please call me at (732) 671 3400, email, comment here, Facebook or Tweet us. I’d love to meet you and if you would like a tour of the hotel or just have a cup of coffee contact me.